It wasn’t quite the 5-0 from last year but Liverpool still have one foot in the Champions League semi-final. First-half goals from Naby Keita and Roberto Firmino have given the Reds a 2-0 lead over Porto ahead of next week’s return leg in Portugal. Although they’re not completely out of reach, Jurgen Klopp insists his side will be ‘ready’ for a strike back from the home side next Tuesday. But at Anfield, some impressed while some did not. Here, we go over the five main talking points. Once again, Liverpool fans were delighted with their captain’s contributions on the night. 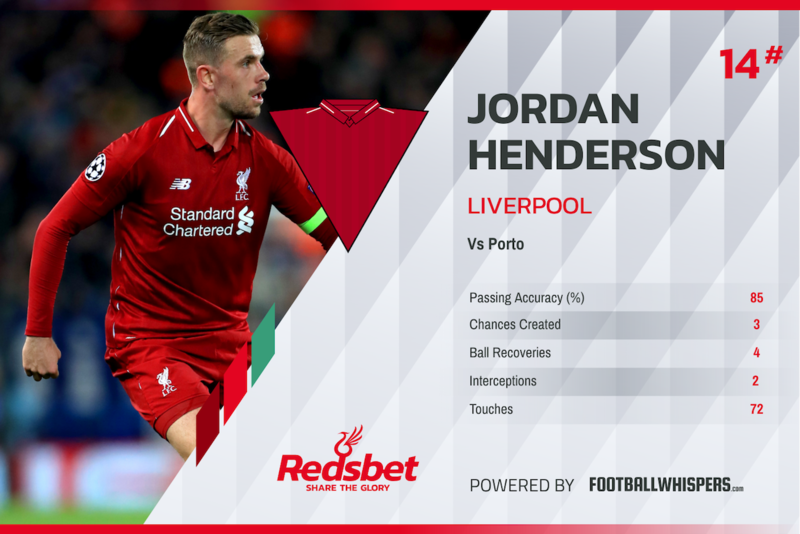 Fresh from a match-winning cameo against Southampton, Jordan Henderson oozed confidence in the middle of the park, splitting the Porto defence with an excellent pass in the build-up to Firmino’s goal. Henderson has come alive at the perfect time. Often shackled by having to take up a deeper position in midfield, the 28-year-old looks to be playing with freedom and confidence and, as it did at St Mary’s, it shaped the outcome of the match. Klopp takes responsibility for curbing Henderson’s attacking instincts. “He likes that position so it is my fault he played for one and a half years as the holding player, but we needed him there,” the German said Tuesday night. Regularly criticised for playing sideways passes from the base of midfield, don’t be surprised if Henderson continues to operate higher up the pitch during the run-in. 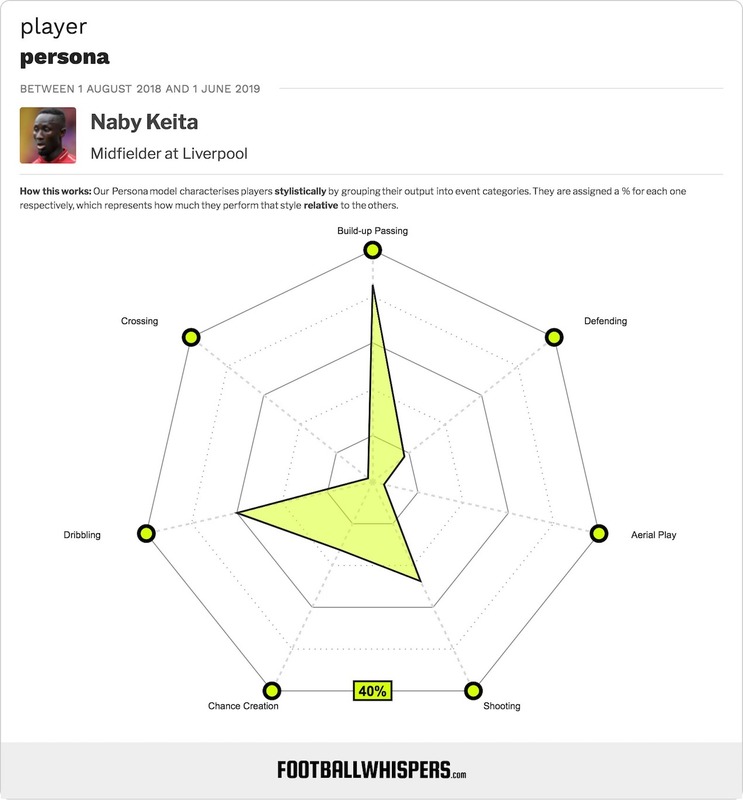 Speaking of midfielders coming into form, Naby Keita has well and truly arrived at Liverpool. For much of his debut season, it’s been a case of heavy is the head that wears the £58million price-tag. There have never been any doubts over his ability, but it must be said that, up to now, Keita has underwhelmed. Whereas Fabinho has settled, Alisson has shone and Xherdan Shaqiri has enjoyed Manchester United-killing moments, Keita has struggled to emulate the creative dynamo that set Liverpool Twitter alight a couple of years back. Thankfully, the 24-year-old has joined the party. After getting his first goal for the club on Friday, Keita looked ready to take centre stage against Porto. And he did. In the fifth minute, the Guinean took up a fine position on the edge of the area, collected Firmino’s lay-off and found the top corner via a deflection. He was outstanding overall, completing more tackles, duels and take-ons than any other player. Keita has come out of his shell. Chelsea, be warned. Sadio Mane’s hot streak has cooled. Now Firmino is the member of Liverpool’s front three tearing defences apart. The Brazilian has four goals and three assists in his last six appearances. On Tuesday, he scored one and set up the other having created Henderson’s strike in the win over the Saints. Add to that his deft, glancing header against Spurs and it’s difficult to ignore his contributions in recent weeks. Of course, Firmino has chipped in regularly throughout the season but there is no doubt that his form dipped slightly in January and February. He has certainly recovered from that slump – and just in time for a huge final month of the campaign. Beyond his goal, the 27-year-old was a constant thorn in Porto’s side, linking the play and pulling defenders out of position. His movement was excellent and he got his reward when, after finding Henderson in midfield, he dashed into the box to tap home Trent Alexander-Arnold’s cross. Yes, it was another productive night in the attacking third for Liverpool’s 20-year-old right-back, notching his eighth assist of the season, but questions must be asked over some of his play. For example, he misplaced 30 passes on the night, including ten long balls. At times when Liverpool needed to retain possession and control the game, he was guilty of gifting the ball back to Porto who, despite losing, certainly carried a threat when they flooded forward. He was also fortunate not to be penalised for a handball inside the box which would have given Porto a precious away goal. Alexander-Arnold has enjoyed a stellar season, one in which he has blossomed as a player, cementing his place as Klopp’s right-back. But while his passing range and driving runs have rightly garnered acclaim, there are times in which he switches off and seems to be on a different wavelength to some of his teammates. Simply put, he cannot afford further lapses in concentration this season. Perhaps the biggest talking point of the night, had Moussa Marega brought his shooting boots to Anfield, the complexion of the tie would be entirely different heading into the second leg. The Malian, who failed in his bid to become just the fourth player to score in seven consecutive Champions League games, only managed 35 touches yet seemed regularly involved. He bullied Dejan Lovren and showed some nice touches to inject urgency into Porto’s attacks. His finishing, however, was erratic. Even before Liverpool had taken the lead, the 27-year-old flashed a shot wide. He spurned a glorious chance on the half-hour mark and another less than two minutes later from a corner. Marega may not have been clinical but Liverpool struggled with his pace and movement across the frontline. He may not be so forgiving next week.